“What is the objective of this page?” Dr. Flint McGlaughlin asked audience member Maile Keone at the Pre-Optimization Summit LPO Workshop in Denver. The problem is the page isn’t achieving the objective — at least not to the extent the marketers (including Maile) at VacationRoost want it to. The page was plastered on two huge screens at the front of the room here at the Denver Marriott Tech Center with 150 marketers from around the world scrutinizing it. So, to help Maile and her team from VacationRoost, Dr. Flint McGlaughlin offered some recommendations for ways to improve the page. When we ask these questions, three optimization recommendations for the page come to mind. The first problem we see with the page is the large seal at the top of the page. If we are trying to answer the question, “Where am I?” the graphic fails. It does not look like a headline, and it doesn’t do much to engage visitors into a conversation. The only solution here to fix it is to remove the seal. State plainly that what follows is an offer explaining VacationRoost’s package deal. Because it looks like a seal, the eye automatically skips over it. Dr. McGlaughlin’s earlier teaching at the Value Proposition session today suggested an approach that involves using more specific data to qualify the idea of big savings. I should mention here that VacationRoost has a lot of great offers. But unfortunately, they aren’t communicated on this page. What would you recommend for fixing this page? Let us know in the comments section of this blog post. Paul Cheney, Senior Partnership Content Manager, MECLABS Paul helps turn raw research into easy-to-understand content for MarketingExperiments and MarketingSherpa readers. He earned his Bachelor of Arts in English Literature from Covenant College. Before joining the MarketingExperiments and Sherpa team, Paul wrote grant proposals and fundraising letters for a mid-size nonprofit in New Jersey. He has also worked as a freelance Internet marketing consultant and copywriter for small businesses. In his spare time, Paul enjoys reading, writing poems, and dating his wife, Callie. My recommendation: Sell the actual product! Imagine you are looking for a new car. Would your dealer tell you to take model A because you can get the optional CD player for a special price? I don’t think so. Your car dealer would try to convince you that model A is the best car in the world for you. And if he’s good, he knows that it’s an emotional thing. He’ll give you facts, but what’s more important: he’ll make you feel good about them! So: Sell the lodging, not the lift tickets. Isn’t that the actual reason for the ad – to sell accomodation? So just do it! Why would I want lift tickets when I still need to be charmed into booking a lodge or whatever accomodation is on offer? Christian is absolutely correct in his comment. The advert is not selling the product! No matter what the add on deals are, the BIG picture should be to book accommodation! Tip #1: Quite often vacation packages really are great value. By looking for and taking advantage of the good deals when they come along, you’ll get a lot more value for your vacation dollars. Tip #2: Paying up front for a bundled package that combines your travel needs, and saves you money, is a smart vacation value strategy. Tip #3: Vacations are good for you, and spending your money wisely will allow you to take more of them. 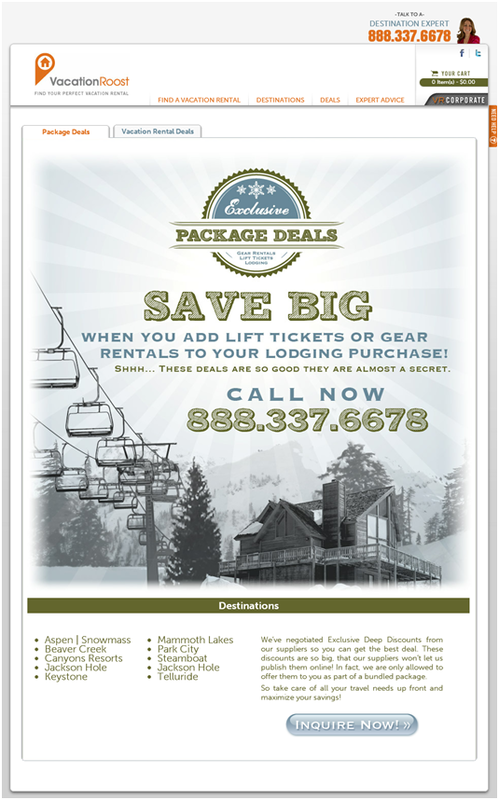 SAVE (15% on average) by adding lift tickets OR gear rentals to your lodging purchase.